28 Watt 2D Round Polycarbonate Bulkhead With Chrome Trim And Opal Diffuser IP20 Rated. 28 Watt 2D Round Polycarbonate Bulkhead With White Trim And Opal Diffuser IP20 Rated. 38 Watt 2D Round Polycarbonate Bulkhead With Chrome Trim And Opal Diffuser IP20 Rated. 38 Watt 2D Round Polycarbonate Bulkhead With White Trim And Opal Diffuser IP20 Rated. The Franklite Acid Decorative Pattern Large Flush Ceiling Light has an opal glass shade and small chrome clips. The Franklite Acid Decorative Pattern Small Flush Ceiling Light has an opal glass shade and small chrome clips. The Oaks Alamas 3 Light Flush Ceiling Light Is In An Antique Brass Finish, Complimented With Facetted Glass Shades. The Oaks Alamas 3 Light Flush Ceiling Light Is In A Polished Chrome Finish, Complimented With Facetted Glass Shades. The Oaks Alamas 6 Light Flush Ceiling Light Is In An Antique Brass Finish, Complimented With Facetted Glass Shades. The Oaks Alamas 6 Light Flush Ceiling Light Is In A Polished Chrome Finish, Complimented With Facetted Glass Shades. The Oaks Alaska 4 Light Flush Ceiling Light Is In An Antique Brass Finish With Mesh Design Shades Inset With Crystal Glass Discs. The Oaks Alaska 4 Light Flush Ceiling Light Is In A Chrome Finish With Mesh Design Shades Inset With Crystal Glass Discs. The Oaks Alaska 4 Light Flush Ceiling Light Is In A Mirror Black Finish With Mesh Design Shades Inset With Crystal Glass Discs. The Franklite Alba 3 Light Ceiling Light is a compact Polished Brass ceiling light with matt opal "brandy balloon" shaped glasses. The Franklite Alba 3 Light Chandelier is a compact Polished Brass ceiling light with matt opal "brandy balloon" shaped glasses. The Oaks Altair 3 Light Flush Ceiling Light Is In Is An Antique Brass Finish With Frosted White Glass Shades. The Oaks Altair 3 Light Flush Ceiling Light Is In Is A Polished Chrome Finish With Frosted White Glass Shades. The Oaks Altair 5 Light Flush Ceiling Light Is In An Antique Brass Finish With Frosted White Glass Shades. The Oaks Altair 5 Light Flush Ceiling Light Is In A Polished Chrome Finish With Frosted White Glass Shades. The Franklite Ambience Small Flush Ceiling Light is in a Bronze finish with crystal glass drops inside a cream strung shade. The Ambience 6 Light Ceiling Light is dressed with glass rods and smooth glass teardrops. The Franklite Ambience Large Flush Ceiling Light is in a Bronze finish with crystal glass drops inside a cream strung shade. The Ambience 8 Light Ceiling Light is dressed with glass rods and smooth glass teardrops. The Anne 3 Light Flush Ceiling Light has a Chrome finish frame with cubed clear glass shades surrounding an inner Chrome finish mesh. The Anne 4 Light Flush Ceiling Light has a Chrome finish frame with cubed clear glass shades surrounding an inner Chrome finish mesh. The Anne 6 Light Flush Ceiling Light has a Chrome finish frame with cubed clear glass shades surrounding an inner Chrome finish mesh. The Anne 3 Light Flush Ceiling Light has a Chrome finish frame with cubed clear glass shades surrounding an inner Copper finish mesh. The Anne 4 Light Flush Ceiling Light has a Chrome finish frame with cubed clear glass shades surrounding an inner Copper finish mesh. The Anne 6 Light Flush Ceiling Light has a Chrome finish frame with cubed clear glass shades surrounding an inner Copper finish mesh. The Firstlght Art Deco 4943 Flush Ceiling Light is in a Chrome finish with an Opal White glass shade. The Firstlght Art Deco 4944 Flush Ceiling Light is in a Chrome finish with an Opal White glass shade. The Firstlight Ascot is a low energy flush ceiling light in White with a polycarbonate diffuser and separate brass trim. The Firstlight Ascot is a low energy flush ceiling light in White with a polycarbonate diffuser and separate brushed steel trim. The Franklite Aspect 3 light ceiling spotlight is in a black and gold finish with adjustable heads. The Franklite Aspect 5 light ceiling spotlight is in a black and gold finish with adjustable heads. The Kansa Astral Flush Ceiling Light has layered, fused rings of glass with Chrome finish metalwork. The Kansa Astral Small Ceiling Light has layered, fused rings of glass with Chrome finish metalwork. The Oaks Balls Crystal Ceiling Light is in a Chrome finish with strings of crystal balls. The Mimax Beacon LED flush ceiling light is a modern, Chrome finish ceiling light with a White polycarbonate diffuser. 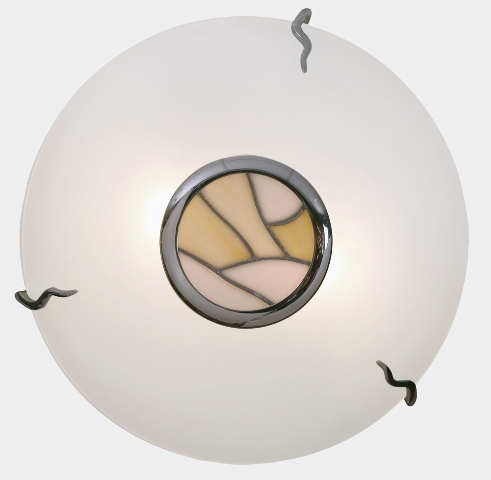 The Oaks Beige Flush Ceiling Light has a Tiffany glass central detail. The Oaks Berga 4 Light Flush Ceiling Light is in a Chrome finish with silver banded shades. The Oaks Berga 6 Light Flush Ceiling Light is in a Chrome finish with silver banded shades. The Firstlight Blanche 3 Light Ceiling Light is in a Chrome finish with moulded clear glass shades. The Elstead Botanic Medium Flush Ceiling Light is in a Dark Aged Brass finish with a sparkling clear pressed glass diffuser. The Elstead Botanic Small Flush Ceiling Light is in a Dark Aged Brass finish with a sparkling clear pressed glass diffuser. The Franklite Medium Brass Clasp Ceiling Light has an opal glass diffuser. The Franklite Small Brass Clasp Ceiling Light has an opal glass diffuser. The Elstead Brinley Flush Ceiling Light is in an Olde Bronze finish with glass "jam Jar" shades. The Elstead Brinley Flush Ceiling Light is in a Brushed Nickel finish with glass "jam Jar" shades. The Interiors 1900 Brooklyn Tiffany flush ceiling light has bevelled and textured glass combined with rich cream art glass. The Franklite Bubble FL2400-3 is in a chrome finish with spherical glass shades. The Franklite Bubble FL2400-5 is in a chrome finish with spherical glass shades. The Franklite Bubble FL2400-6 is in a chrome finish with spherical glass shades. The Avivo Bubbles 3 Light Ceiling Ligh Platet is in a Chrome finish with beautiful heavy glass bubble balls. The Avivo Bubbles 5 Light Ceiling Ligh Platet is in a Chrome finish with beautiful heavy glass bubble balls. The Avivo Bubbles Small Single Flush Ceiling Light is in a Chrome finish with a beautiful heavy glass bubble ball. The Elstead Cadence Flush Ceiling Light is in a Dark Antique Brass finish. The Elstead Cadence Flush Ceiling Light is in a Brushed Steel finish. The Eglo Calaonda 10 Light Round Flush Ceiling Light is in a Chrome finish, dressed with sparkling crystal drops in a variety of shapes and sizes. The Eglo Calaonda 7 Light Flush Ceiling Light is in a Chrome finish, dressed with sparkling crystal drops in a variety of shapes and sizes. The Eglo Calaonda 8 Light Ceiling Light is in a Chrome finish, dressed with sparkling crystal drops in a variety of shapes and sizes. The Elstead Cambridge Solid Brass Flush Ceiling Light is in a Burnished Brass finish with clear optic glass. The Firstlight Caprice 4850 LED Flush Ceiling Light is in a Chrome finish with a 3 year manufacturers guarantee. The Firstlight Caprice 4851 LED Flush Ceiling Light is in a Chrome finish with a 3 year manufacturers guarantee. The Firstlight Caprice Semi-Flush LED Ceiling Light is in a Chrome finish with a 3 year manufacturers guarantee. The Elstead Carabel Semi-Flush Large Ceiling Light is in a Brushed Champagne finish with elegant, pierced metalwork. The Elstead Carabel Semi-Flush Small Ceiling Light is in a Brushed Champagne finish with elegant, pierced metalwork. The Franklite Carillon 10 Light Ceiling Light has beautiful smooth glass rods suspended from a Chrome finish backplate. The Franklite Carillon 4 Light Ceiling Light has beautiful smooth glass rods suspended from a Chrome finish backplate. The Franklite Carillon 8 Light Ceiling Light has beautiful smooth glass rods suspended from a Chrome finish backplate. The Kolarz Carla 0256.13L.5.KpT is in a chrome finish with dazzling strands of sparkling crystal beads. The Kolarz Carla 0256.13S.5.KpT is in a chrome finish with sparkling crystal beads and an opal glass diffuser. The Kolarz Carla 0256.15L.5.KpT is in a chrome finish with dazzling strands of sparkling crystal beads. The Kolarz Carla 0256.15S.5.KpT is in a chrome finish with sparkling crystal beads and an opal glass diffuser. The Kolarz Carla 0324.11.5.KpT is in a chrome finish, dressed with glittering crystal drapes. The Kolarz Carla 0256.11.5.KpT is in a chrome finish, dressed with glittering crystal bands. The Kolarz Carla 0256.13L.3.KpT is in a gold finish with sparkling crystal beads. The Kolarz Carla 0256.13S.3.KpT is in a gold finish with sparkling crystal beads and an opal glass diffuser. The Kolarz Carla 0256.15L.3.KpT is in a gold finish with sparkling crystal beads. The Kolarz Carla 0256.15S.3.KpT is in a gold finish with sparkling crystal beads and an opal glass diffuser. The Kolarz Carla 0324.11.3.KpT is in a gold finish, dressed with glittering crystal bands. The Kolarz Carla 0256.11.3.KpT is in a gold finish, dressed with glittering crystal bands. The Firstlight Casa Large Decorative Fluorescent Ceiling Light is in a Brushed Steel finish. The Firstlight Casa Small Decorative Fluorescent Ceiling Light is in a Brushed Steel finish. The Avivo Cascade 16 Light Round Flush LED Ceiling Light is in a Chrome finish with clear hexagonal crystal glass bubble tubes. The Avivo Cascade 16 Light Square Flush LED Ceiling Light is in a Chrome finish with clear hexagonal crystal glass bubble tubes. Luxury Lighting are proud to offer a fantastic selection of quality flush ceiling lights and semi flush ceiling lights in modern, traditional and contemporary designs to suit all. These flush ceiling lights are an ideal solution for lighting rooms in the home with low ceilings.